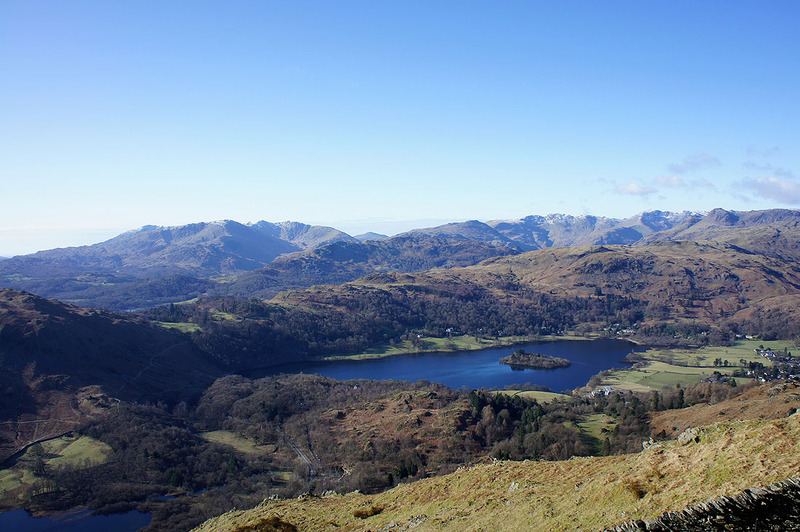 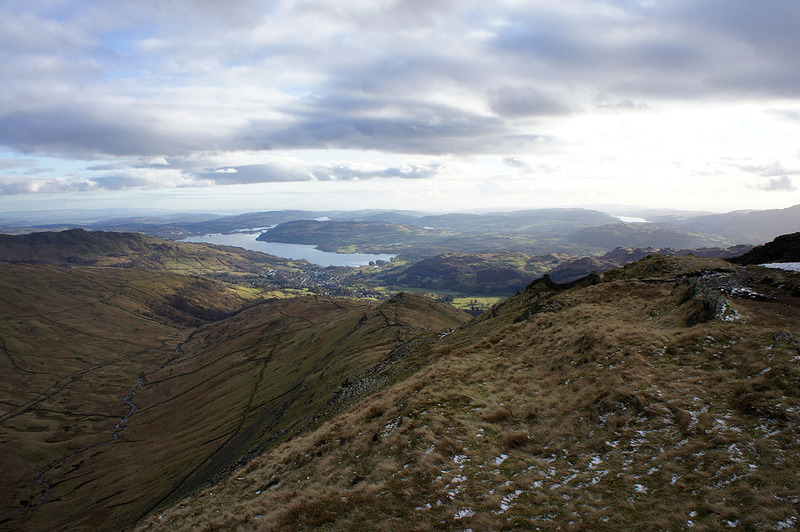 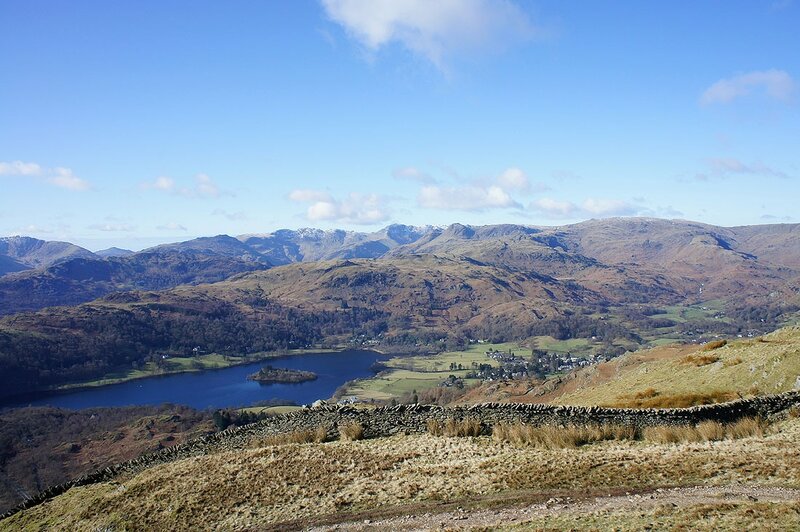 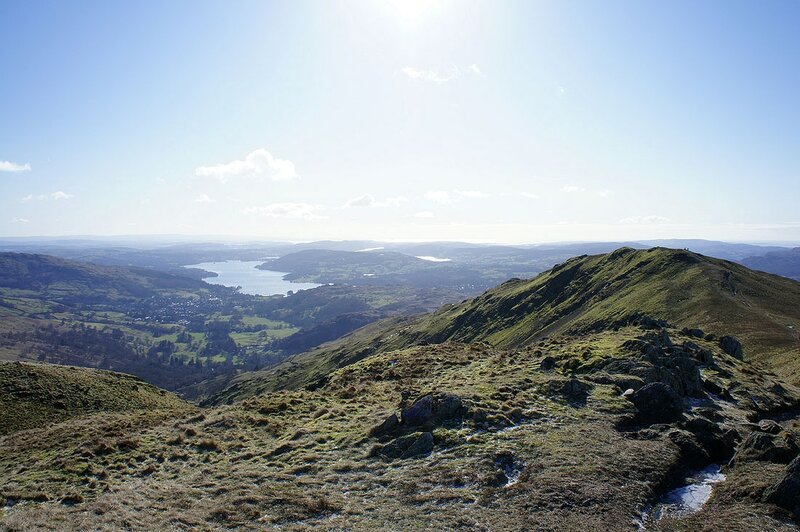 The Fairfield Horseshoe from Ambleside taking in Nab Scar, Heron Pike, Great Rigg, Fairfield, Hart Crag, Dove Crag, High Pike and Low Pike. 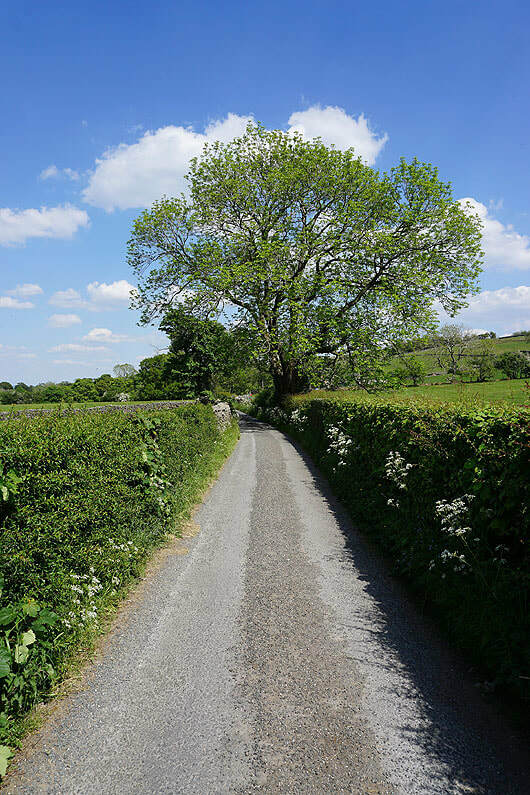 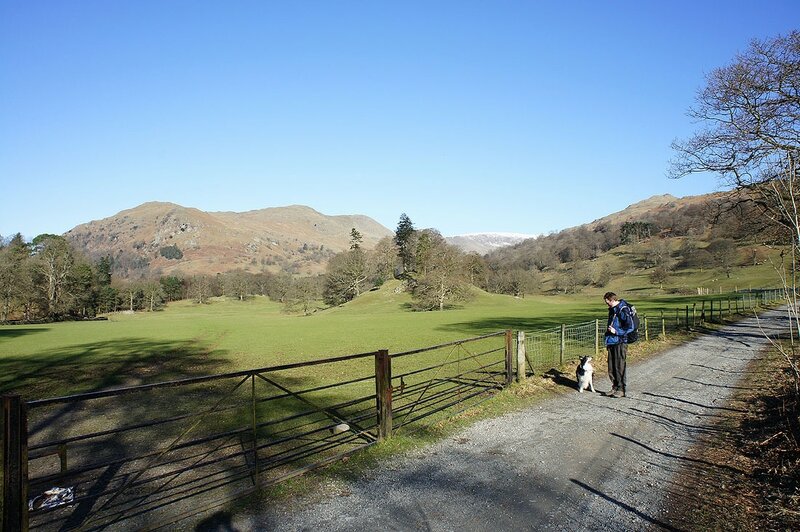 I've done this walk several times, both clockwise and anti-clockwise and today I decided on the former so that the steepest climb of the day was at the start. 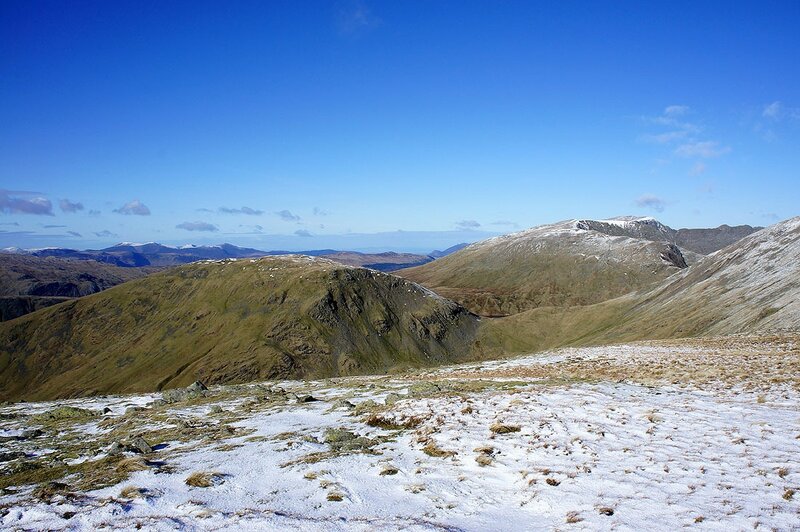 It was a fine winters day for this walk but with a bitterly cold wind higher up, though on the climb up Nab Scar we were taking layers off as there was no wind only to put them back on again at the top. 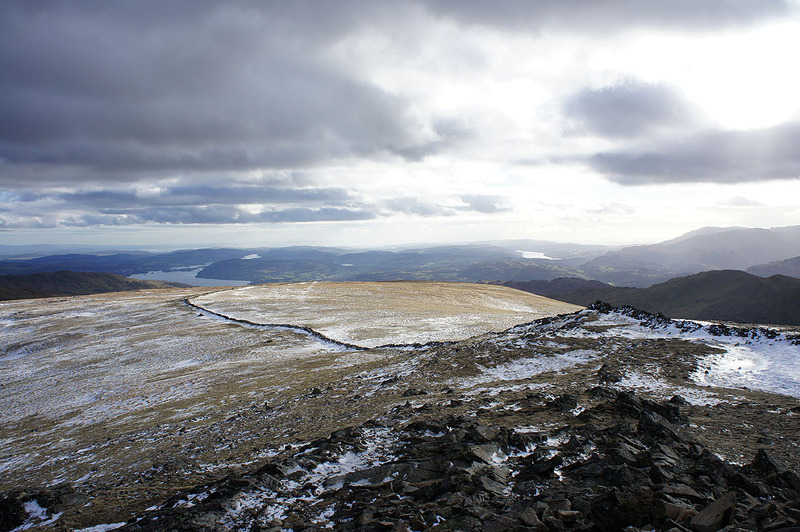 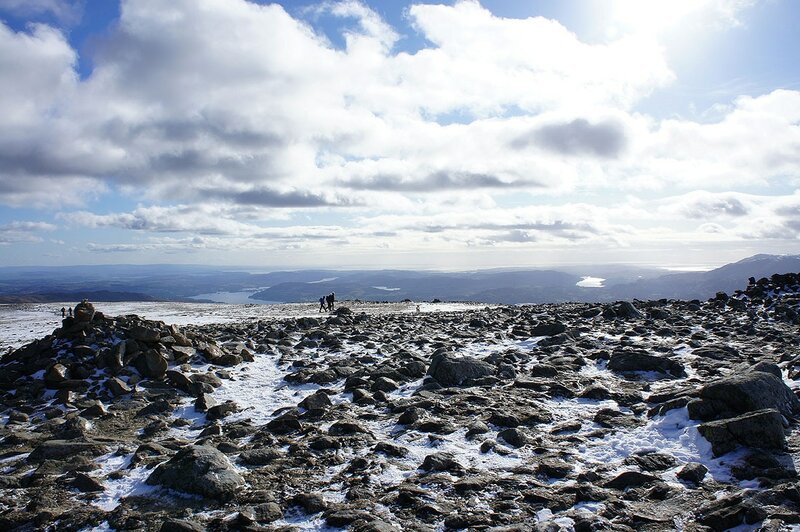 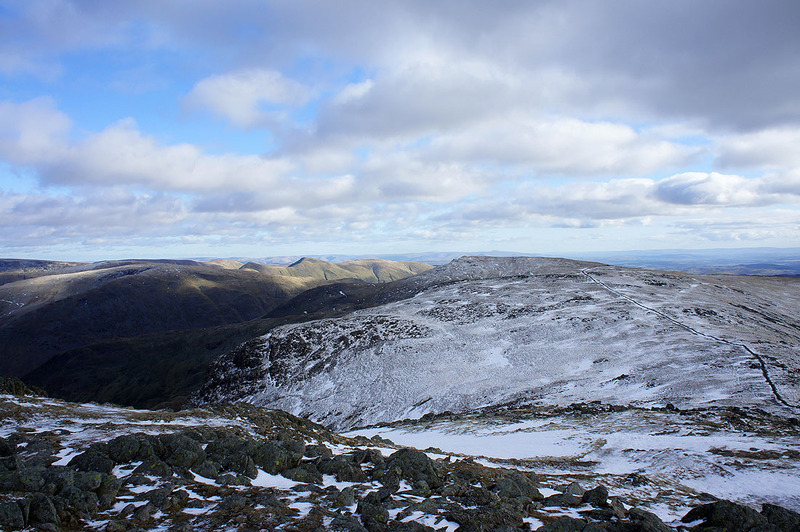 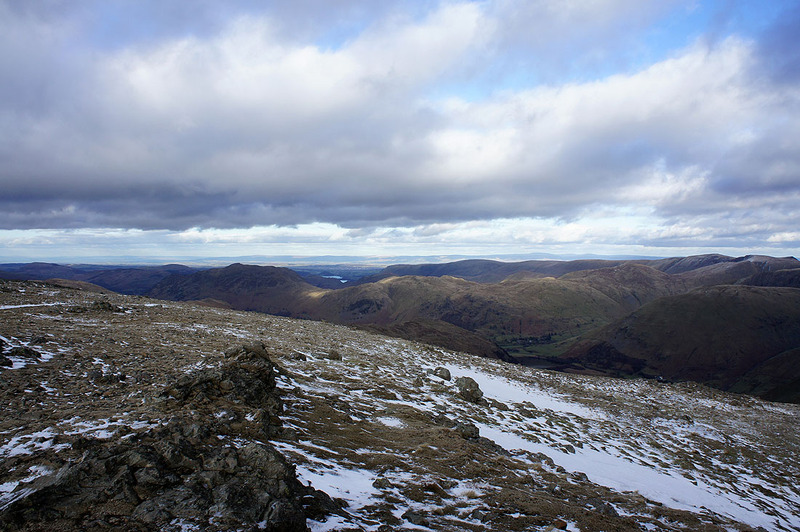 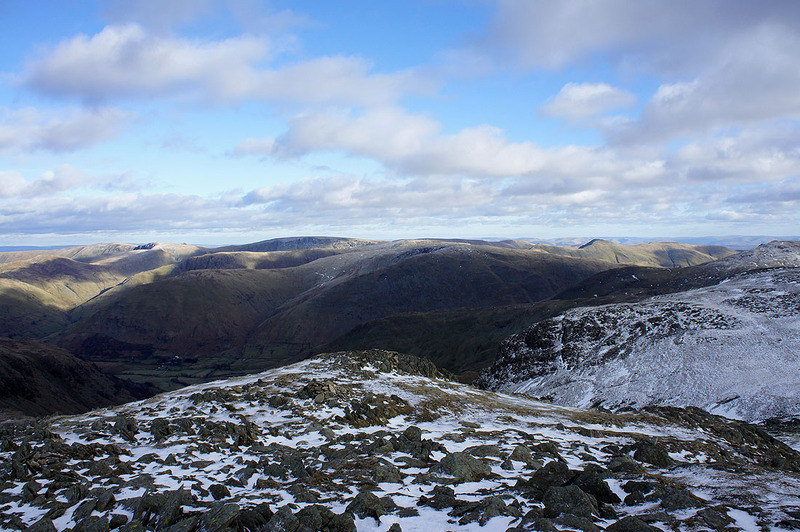 There was some ice about particularly on Fairfield, Hart Crag and Dove Crag but nothing that couldn't be safely avoided. 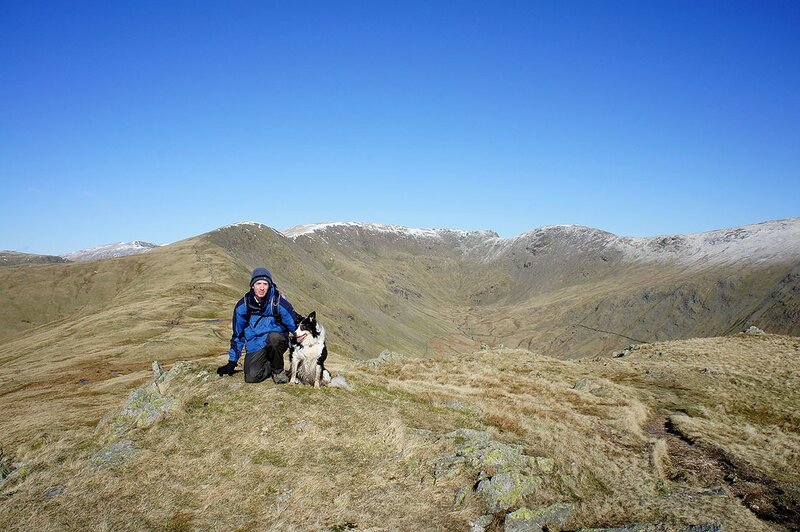 My youngest brother Andy and one of my parents' dogs Milo joined me for the walk. 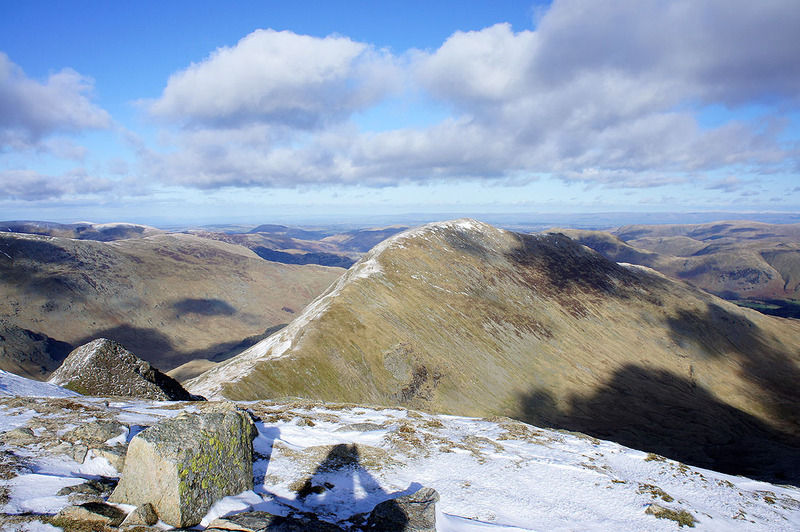 The view towards the Crinkle Crags, Bowfell and the Scafells from Erne Crag. 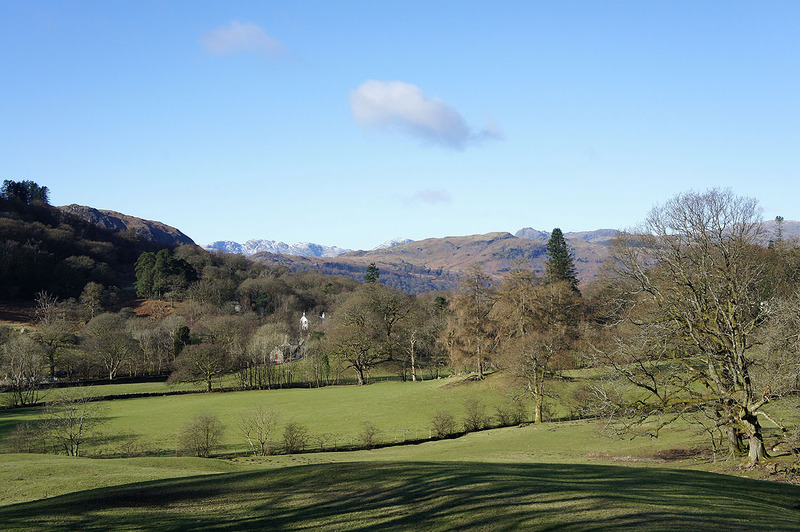 The rocky fell down on the right is Helm Crag. 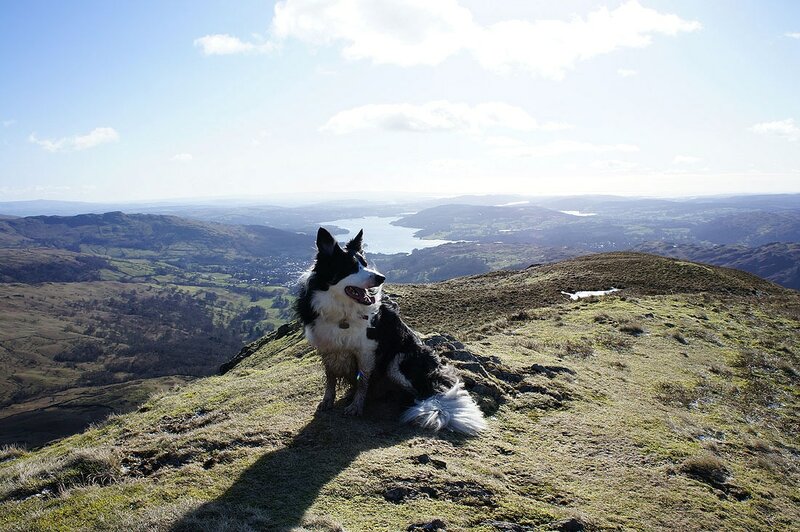 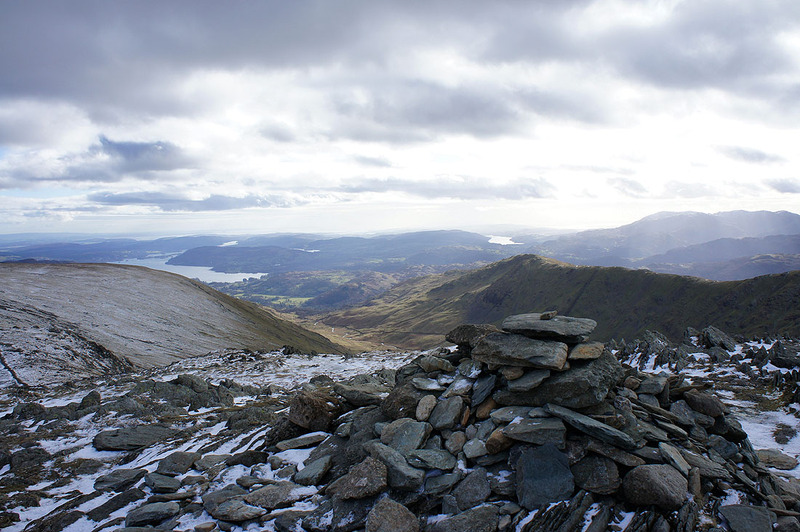 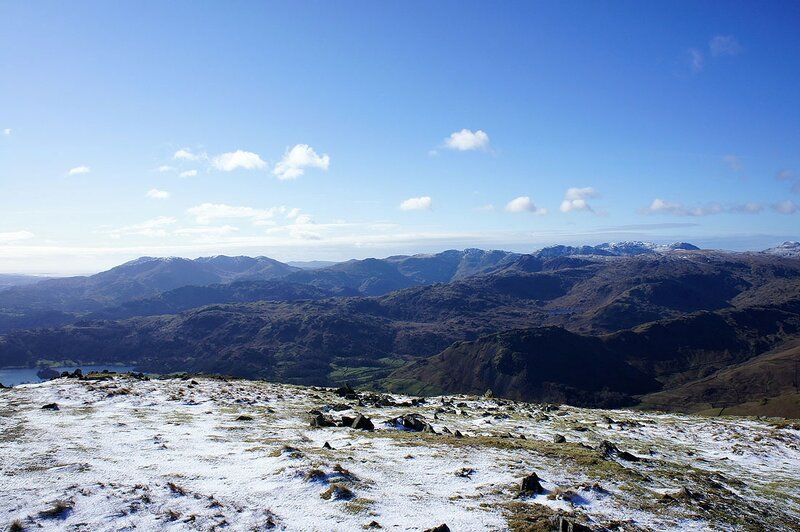 On the next summit of the day, Great Rigg and the view is even better. 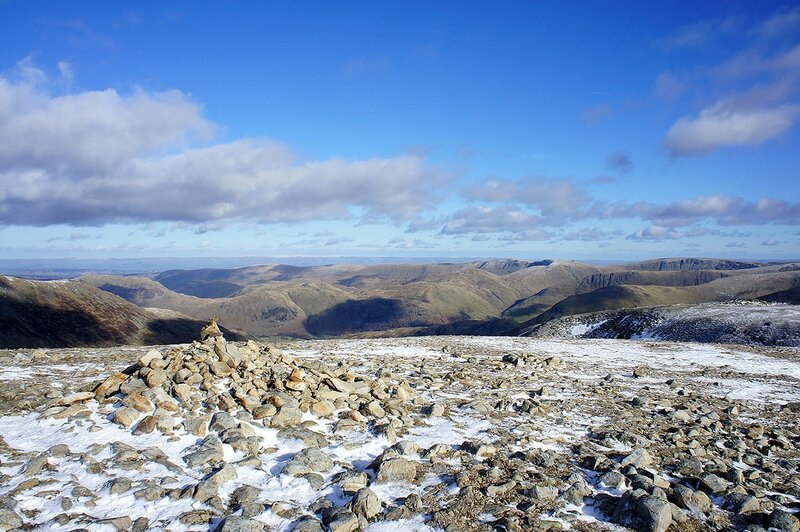 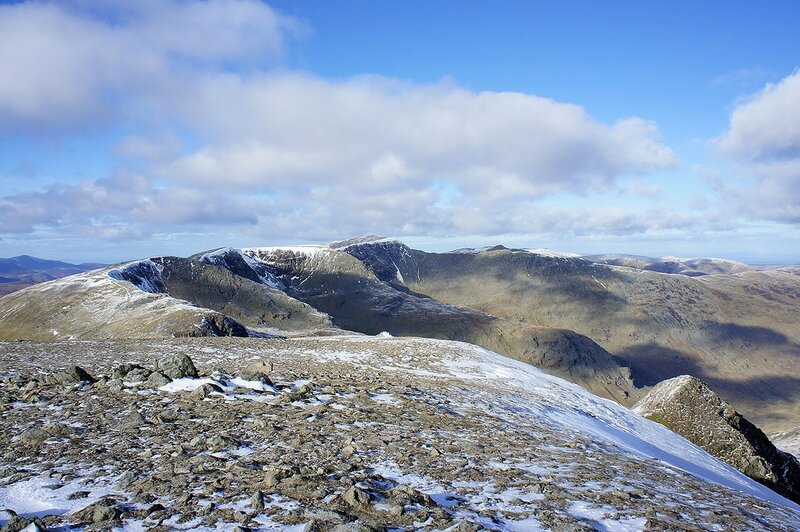 Along the skyline are the Crinkle Crags, Bowfell, the Scafells, Great Gable, Pillar and the High Stile range. 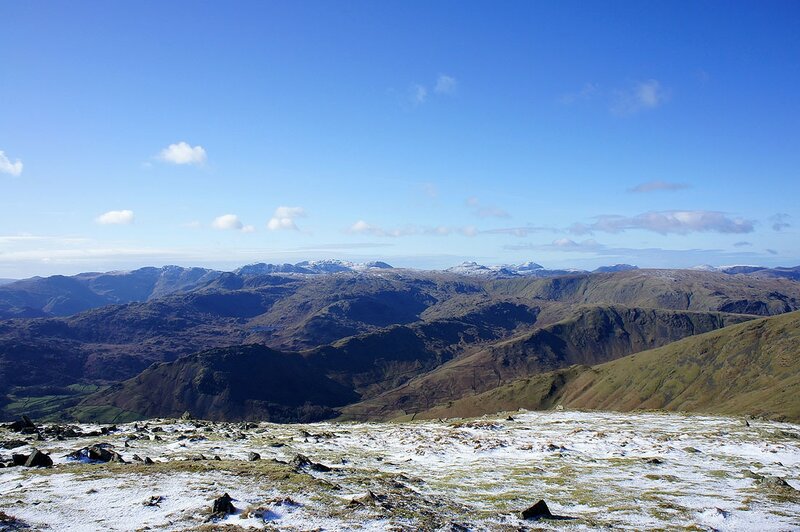 Far eastern fells from Fairfield. 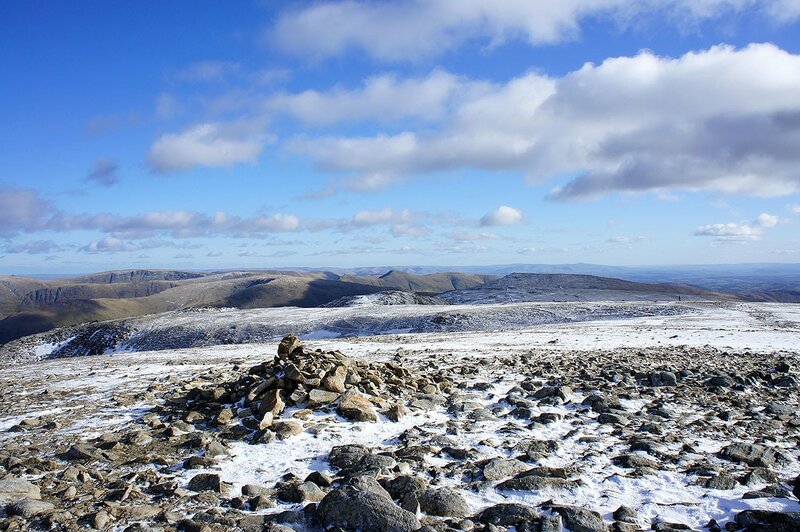 The view includes Loadpot Hill, High Raise and High Street. 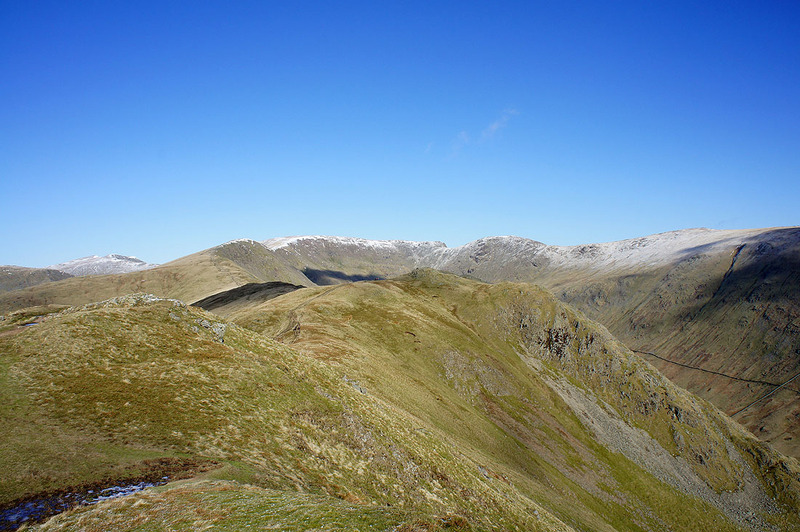 High Street and the Ill Bell ridge in view. 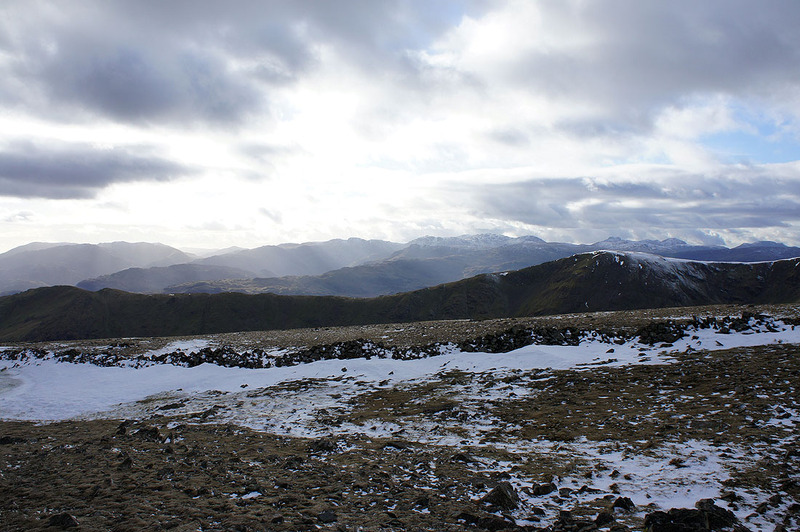 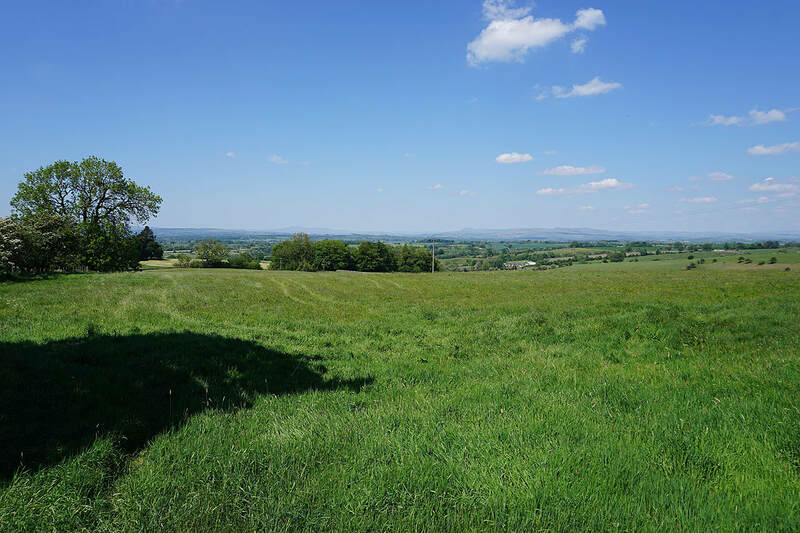 The Howgills and Ingleborough can be made out in the far distance. 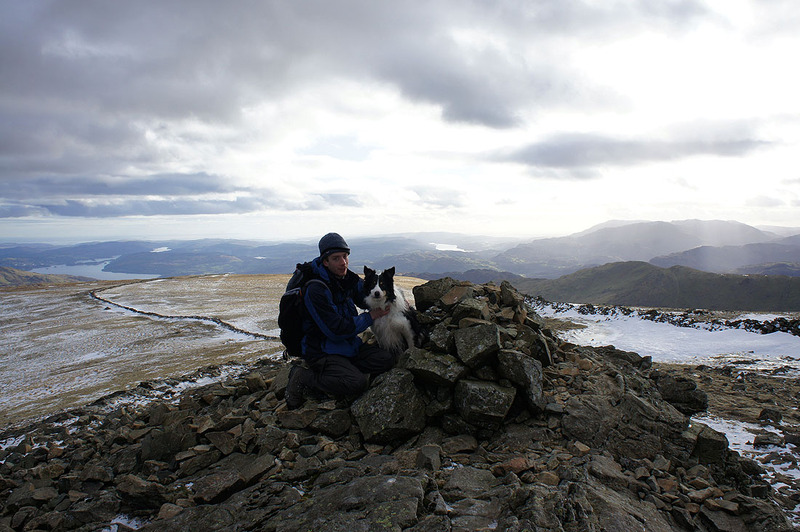 Dove Crag summit. 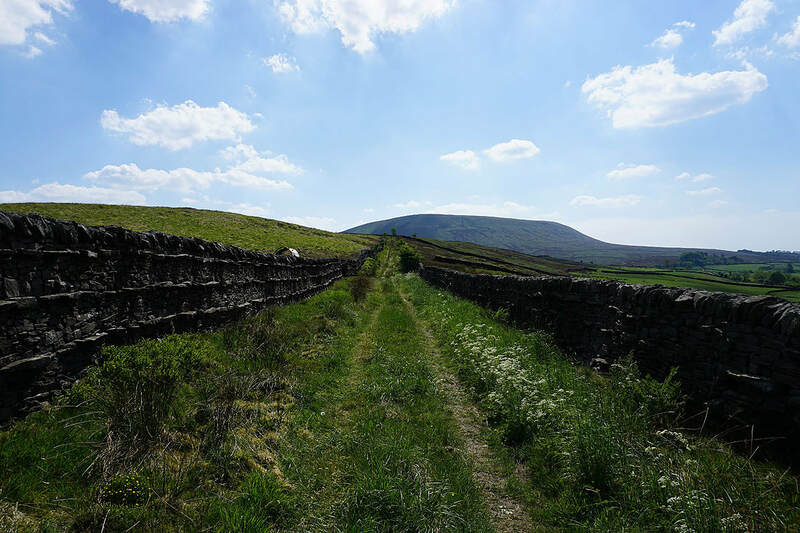 Just follow the wall. 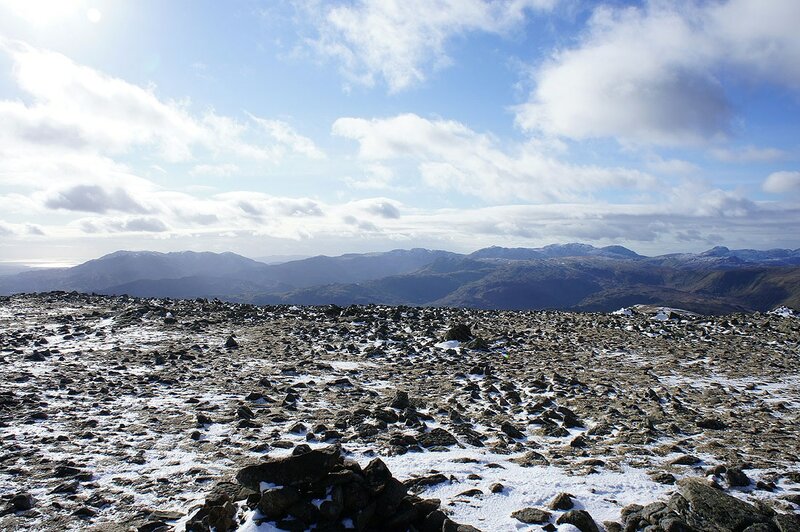 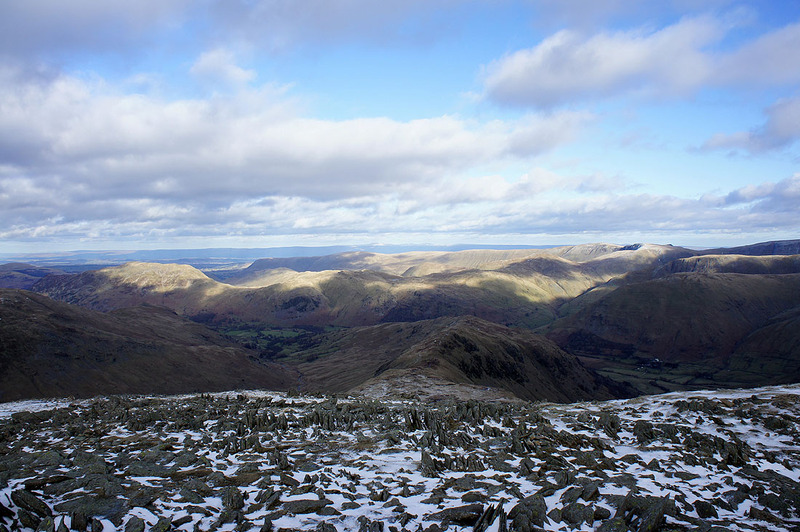 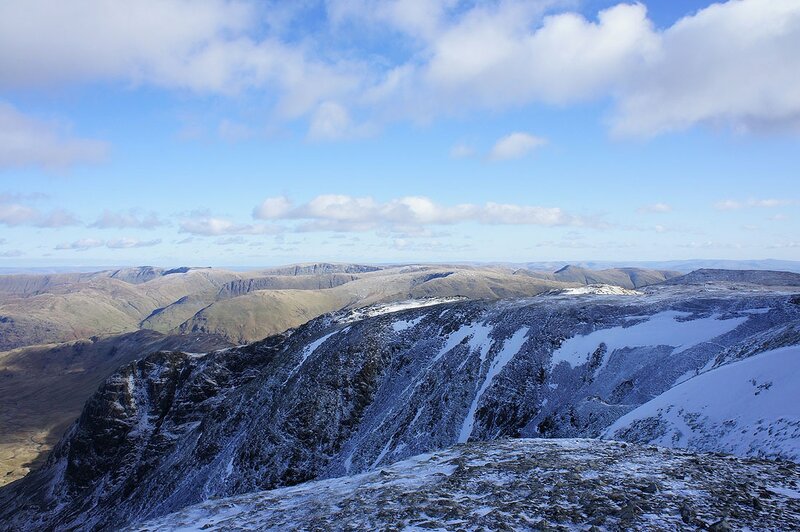 The Coniston fells, Crinkle Crags, Bowfell, the Scafells, Great Gable and Pillar from Dove Crag. 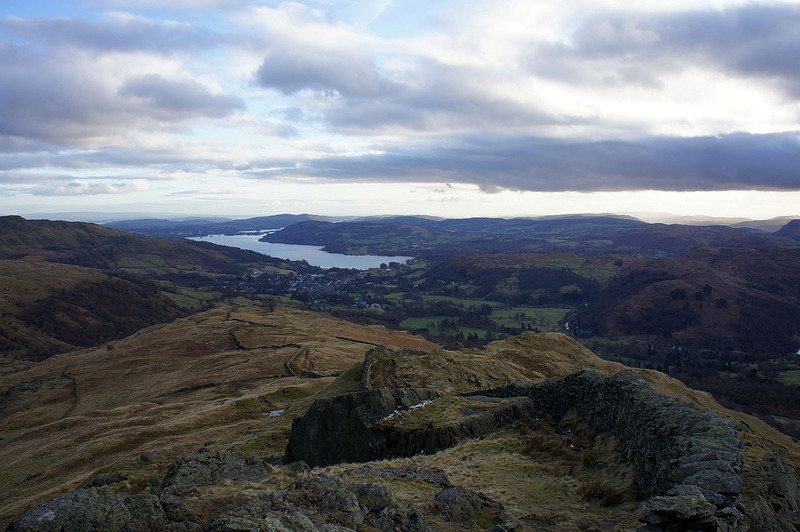 The ridge in the foreground is the route of ascent from Heron Pike to Great Rigg. 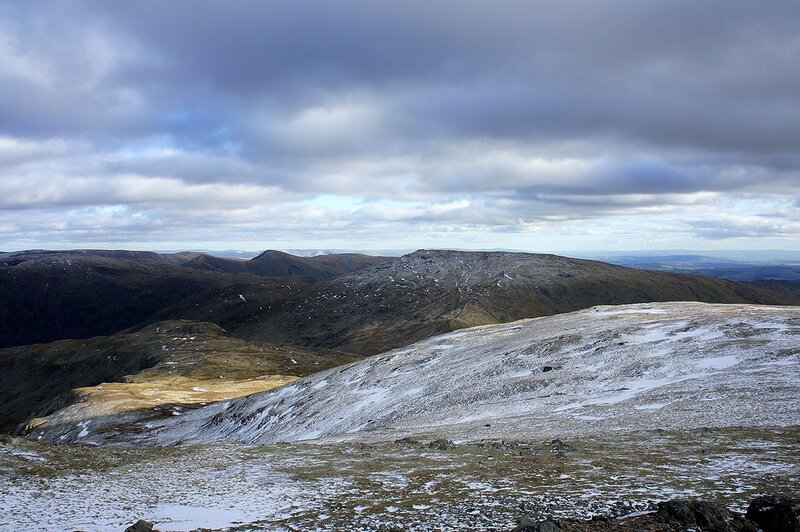 The visibility was excellent throughout the day with far distant hills visible, so while I was on High Pike I tried to get two well known hills in the picture. 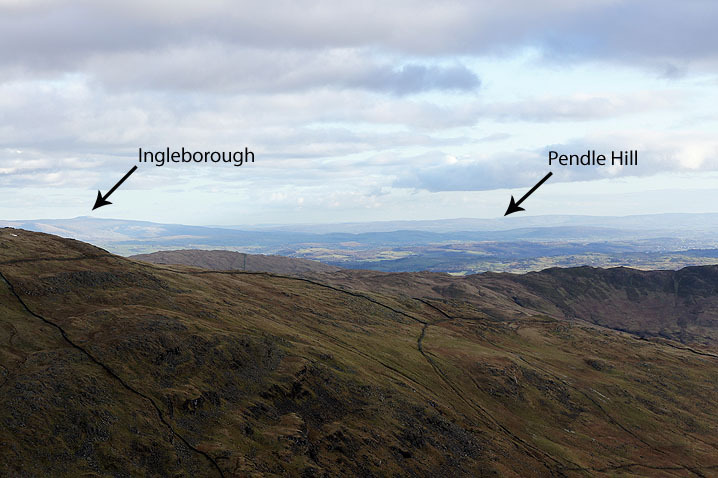 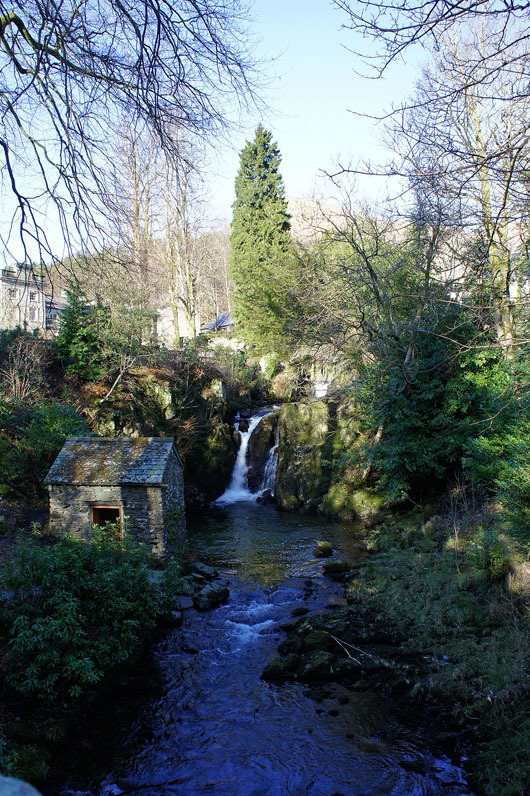 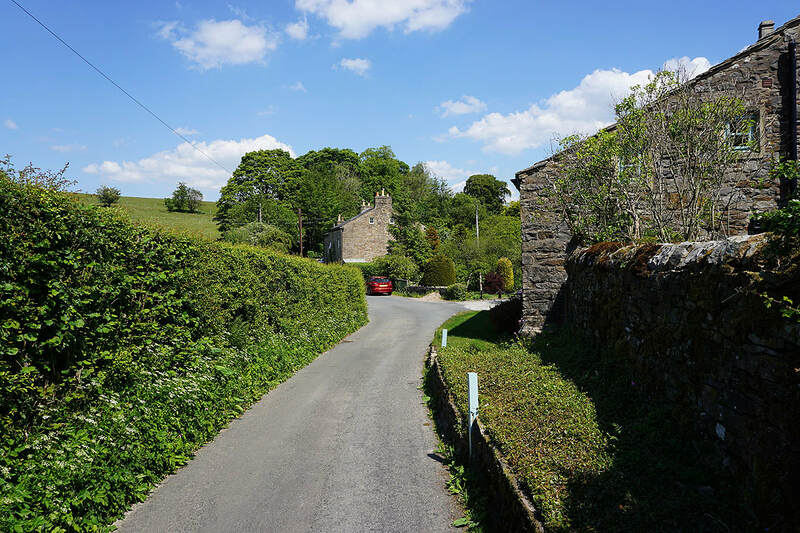 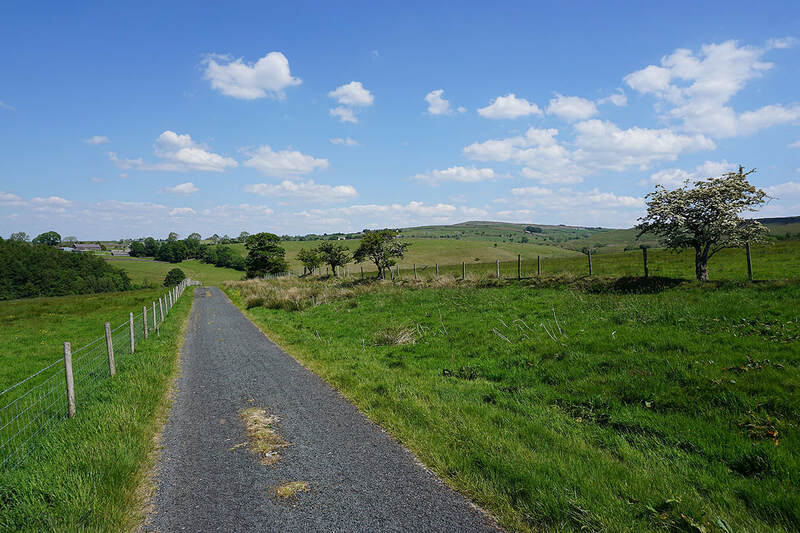 Ingleborough is easy to spot but Pendle Hill is more difficult to distinguish from the surrounding hills.